Menstruation is a natural phenomenon which almost half of the population undergoes. Yet, we find difficult to speak about it in the public. Myths and taboos around menstruation can be traced back to the Vedic period, deeply rooted in the Indian religion and culture. Even today, women lack the power to freely talk about it, ask for sanitary products and are made to feel awkward while handling them. Due to inadequate access to hygiene products, women are forced to use unhygienic alternatives which are fatal and cause serious health issues. Most girls in rural areas skip school and even drop to handle something so natural due to insufficient access to water, sanitation and hygiene (WASH) facilities and hygiene products. To eradicate this problem, we need to understand the challenges faced by different segments of women in our society who continue to live in shadows, quietude and oppression due to lack of proper knowledge about sanitary napkins and hygiene. It’s high time when both men and women engage themselves in stigma lifting initiatives and spread awareness about the importance of good menstrual hygiene management. In addition to menstrual hygiene there are several other key elements of gender issues in water and sanitation programmes which need to be examined for improved gender outcomes. Gender Issues in Water and SanitationProgrammes by SAGE Publications is a worthy addition to the literature on water, sanitation and hygiene. 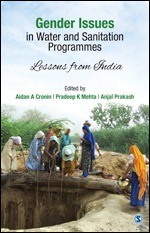 The book recommends ways for improved gender outcomes and WASH impact in India, documenting both quantitative and qualitative information on gender issues. Realizing the magnitude of the problems pertaining to women, there are several initiatives taken by the government and NGOs to normalize menstruation as a healthy and positive part of the female life cycle. It’s time that the society breaks the silence and talks about MENSTRUATION. Grab your copy of the book today to unpack the key elements of WASH–gender nexus at an exclusive 20% discount. Write to us at marketing@sagepub.in with code SM20.